The finely-tuned ukuleles, all ready for the next fun-filled taster session! 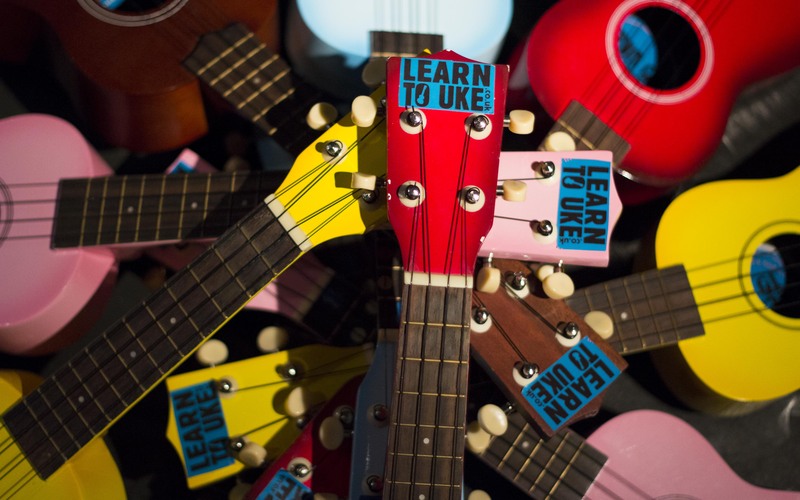 We’re back and teaching ukulele taster sessions so you can try it out, with your mates, in the pub on a Thursday night or Saturday afternoon. Yes, you are welcome to have a drink. Yes, you are welcome to heckle. It’s not school, and you won’t be learning to play ‘Twinkle Twinkle’. Look here for the next scheduled date. It’s been a long old summer. I can’t wait to get back to school tomorrow, teaching whole class ukulele and after school club. I wonder what will be in store for me? I’m now in my 5th year of teaching. The first children I taught (those featured on the Frank Skinner BBC Documentary thing) are now in high school. I miss those little fellas. Many of them are now taller than me! Anyway. Approaching the school gates, I felt old and subdued. Then I was greeted with children screaming my name and excitedly running over to say hello. They made me feel like a queen or celebrity. How could anyone feel old or subdued with that kind of welcome? Also, we had the highest attendance of an ex student group at an after school club that we’ve ever had. In it was a a brilliant moment, which I’ll smile about and treasure always. During my usual ‘what do you want to learn’ question at the beginning of the class, one of the formerly-scornful-ukulele-hating-football-loving kids asked for YMCA. Cue the kids singing in really loud voices, doing the actions, giggling and generally having a good time. The face of the teachers walking past, followed by bewildered giggles. It was a very beautiful thing. I love my job!